Solution to delete or uninstall Windows 8, 8.1 and 10 App's (applications), or add to Win 8/10 Start (menu)! 1.) Delete eg. uninstall the APPs in Windows 8.1 and 8! 2.) A list of all APPs on Windows 8 / 8.1 via PowerShell! And delete in one shot! Hot-Tip: ... How to Clean up the app folder in Windows 8.1 and 8! the key combination (hotkey, shortcut) [Windows Logo] + [Q] and also uninstall apps via right mouse clicking, ( ... see Image-2 Arrow-2), or add it back to Windows 8 START ( ... see Image-2 Arrow-3). In the Windows-8 Start, you can also via drag and drop sort or reorder the Windows 8 apps (applications) ( ... see image 1 ). You can't uninstall the Windows 8 app-s like other programs. See:... How to uninstall programs in Windows 8? See also: ► Remove Bad APPs from Windows-10 (uninstall, delete)! powershell "Get-AppxPackage -AllUsers" Now all Windows APPs are listed! powershell "Get-AppxPackage -AllUsers | Remove-AppxPackage"
When you now create another user account in Windows 8 or 8.1, this account will be created without the Metro APPs! (Image-3) Deleta all apps from Windows 8.1 and 8, at once via PowerShell! (Image-1) Windows 8.1 without apps in Windows Start! Windows-8 - FAQ-60: Uninstall or delete Windows 8.1 / 10 Applications! Hide Windows 8.1 libraries or remove, delete, add, can you do that? Windows start menu apps in windows 8.1? How to delete google on win8, Dislodge apps from windows 8.1? Windows 8 start menu delete? How to remove apps from windows 8.1 start menu? Windows8: how to remove apps from start menu? How to uninstall applicaations on windows 8.1? There is not uninstall button for uninstall apps in windows 8.1? How to clear windows 8.1 or deleting apps from start windows 8.1? Delete photos app windows 8.1? How to remove Some settings are managed by your organization. in windows 10 home? How to.romove all apos from windows 8 start menu? Adding deleting app windows 8? How to uninstall windows 8.1 application? Deleting programs in windows 8? Remove wajam from apps menue windows 8 or how do i delete start menu items window 8, delete Windows 8 apps? How to delete Windows 8.1? Windows 8 and 8.1 remove application from start menu? How to delete application from windows 8.1? Can i uninstall smart menu from windows 8.1 or Disable windows 10 apps menu? Remove apps from windows 8 iso? Windows 8.1 add programs to menu? How to remove apps from start in windows 8? How to uninstall windows 8.1 software and apps? Deleting startup items in windows 8.1? Force remove software in windows 8.1? How to delete apps on windows 8.1? Eliminate Apps on Windows 8.1 or Delete windows 8.1 app? How to uninstall app from metro mode 8.1? How to uninstall windows 8.1 from command prompt? How to delite unwanted program in windows 10? Uninstall software from windows 8.1? Windows 8.1 Uninstall App, and uninstall windows 8.1 apps? UNINSTALL WIN8 APPS for ever? How to uninstall apps on windows 8 store? How do I delete applications from windows 8 start menu? Remove all apps from windows 8.1? How do I delet an app from 8.1 computer? 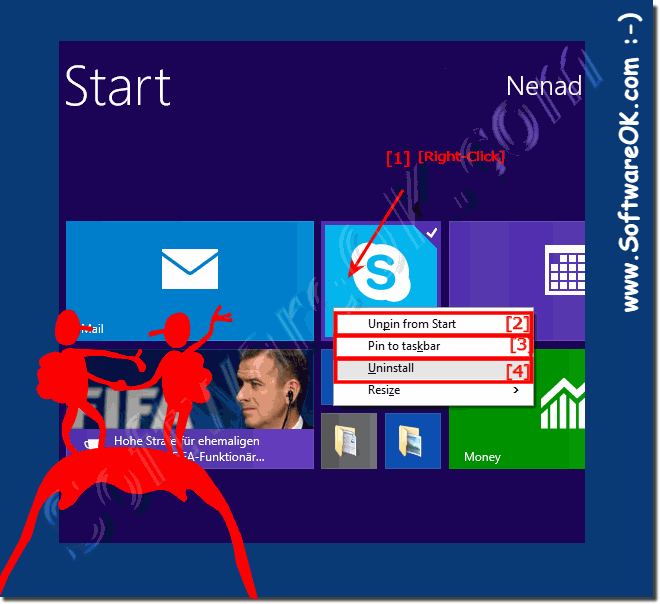 How to dislodge application from the start menu win 8 or How to clear windows 10 app? Remove app from start menu? Windows 8.1 remove all apps? Windows 8.1 delete app from start? Windows 8.1 delete all games or Remove apps from windows 10? Clear app from start menu windows 8? Windows 8 and 8.1 delete app? Add app to start menu windows 8.1? How to delete an app in windows 8? Windows 8.1 remove metro apps reference image? Remove wajam certificate on windows 8.1? Delete All Apps Windows 8? All apps button disable windows 8? How do i delete an app off of my windows 8 menu? How can I disable the windows 8.1 flyin menu? Win 8.1 apps remove or how to uninstall metro apps in windows 10? Remove app from windows 8 start menu for everyone? How to delete start menu history windows 8.1? How to delete app from 8.1? How to uninstall program using command prompt in windows 8.1? Uninstall an app in windows 8.1? Remove programs from app menu windows 8? How to uninstill all programs in windows 8 and 8.1? Why cant i remove programs from windows 10? Delete icon on windows 8.1 apps menu? Windows 8.1 pro uninstall default apps for every users? How to delete software windows 8, Can't unistall asphalt 8 app from windows 8.1? Windows 8.1 delete app icon? Remove applications from start menu windows 8? Can't delete contents of add site to apps in win 8.1? Windows 8.1 how to remove apps from start? Remove apps from start page window 8.1? Add/Remove Programs Windows 8.1 start menu? Remove app from windows 8 all apps menu or how to remove icons from the apps menu windows 8? Windows 8.1 app remove, e.g. how to clear apps from windowsapps folder? Remove icons from start menu windows 8.1? Removing programs from start menu windows 8.1? How to delete windows 8.1 aps? Delete photos app in 8.1? Remove apps from start menu windows 8 or Delete app windows 10? How to remove an app from the start page in windows 8.1? How to remove applications in Windows 8.1? How do i delete windows 8.1? Add apps win 8 and 8.1? How to clean up the app folder in Windows 8.1? Deleting apps on windows 8.1? Windows 8.1 how to delete apps from windowsapp? Delete start menu windows 8? Delete games from start menu windows 8? Delete an application from startup windows 8? Deleting windows 8.1 or HOW TO delete apps off a windows 10? Win8 remove from start menu or Remove Windows 10 and 8.1 Start Menu? 8.1 apps delete or disable? How i can delete completely a windows store app in win 8.1? Remove icon from apps menu? Windows 8.1 apps will not remove using cmd? How to uninstall a program using cmd in windows 8.1? Delete apps win 8 or Remove apps windows 8 start menu? Windows 8 and 8.1 Uninstall Apps? How to remove apps from startup programs in windows 8.1? Windows 8.1how to delete app icons? How do i remove an app from windows 8.1? Delete apps on win 8? Windows 8 and 8.1 remove applications? Cmd to uninstall app on windows 8.1, Remove windows 8.1 apps? Uninstall windows 8.1 app or eliminate Apps Windows 8? How do i delete browers app from my 8.1 windows? 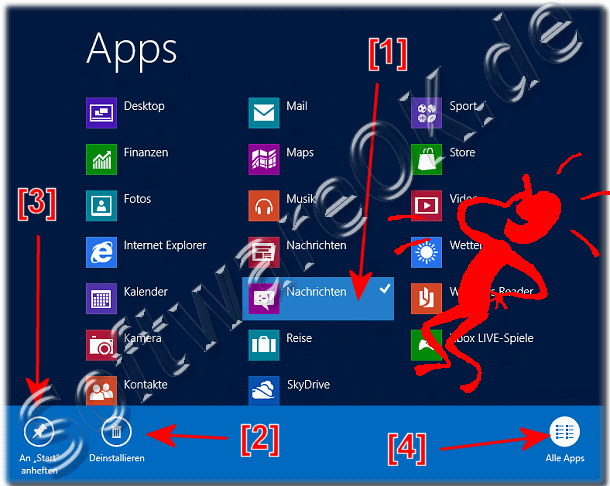 App disinstallaren windows 8.1 or delete apps win8.1? How to remove some application on win 8.1? Remove apps from start menu windows 8? Add programs to start menu windows 8.1, or Remove windows 10 application? Remove apps from start menu on windows 8? Windows 8 start menu uninstalled program shortcuts? Delete apps from start page win8? How to uninstall programs with command prompt in windows 8.1? Force uninstall app in windows phone 8.1? Does deleting an App icon on the desktop view in Windows 8.1 delte the App? On my new computer with windows 8.1 can i delete some of these apps that i will never use? HOW TO DELETE ALL DOWNLOADED GAMES IN WINDOWS 8.1 STORE SURFACE RT? Windows 8 remove apps from start menu windows 8? Remove win 8 apps for ever? Unistall 8.1 default apps command line? Remove apps from start screen windows 8.1 command? Uninstall windows 8 start apps? How to remove an app from windows 8 app menu? How to erace windows8.1, delete apps from start menu? Remove start menu icons powershell windows 8? Deleting unwanted windows 8.1 apps or Uninstall apps in safe mode in windows 10? How to delete apps in windows 8.1? How to remove app from start menu in windows 8.1? How uninstall the windows store from Windows 8 for allusers? Windows 8 delete start menu? How to delete Windows 10 apps? How to remove program icon from startup foder? Delete applications in windows 8? Remove app from start menu windows 8.1 on surface? Windows 8.1 enterprise disable arrow to access apps view? Delete apps from windows 8 and uninstall app windows 8.1? How to remove popular apps from start button menu windows 8.1? Software to remove windows 8.1 apps? 8.1 how to delete apps? Win 8 and 8.1 uninstall app? How to uninstall app from start menu? How to delete an app from startup menu windows 8? Delete apps in windows 8.1? Uninstall windows 8 apps for ever? Remove apps from windows 8.1 startup folder? How to remove windows default apps in start menu of windows 8? How to uninstall unwanted stuff from windows 8.1 enterprise N? Remove installed apps windows 8.1 all users powershell? Remove icons from start menu in windows 8.1? Win8 start menu, deleting entries from windows start menu? How do i add app from start menu to desktop on windows 8.1? Remove uninstalled apps from app menu windows 8? Remove app in start menu in windows 8.1? I can't delete anything using windows 8.1? Uninstall menu in windows 8 for ever? Remove windows store icon from start menu? How to add delete apps desktop windows 8.1? How to delete hard delete unwanted apps in windows 8.1? Remove all windows 8 menus?